A brand new Walking Dead spin-off has launched online. The new web-series, titled ‘Passage’, premiered its inaugural episode yesterday (October 18) on AMC’s official website. AMC will unveil a new episode every week on their site, during new episodes of The Walking Dead in the US. In the first episode, a living man in a bio-hazard suit is seen walking through what looks like a zombie-savaged military base. He spots a screaming, living woman, and rushes to her aid against a couple of walkers. The walkers look fairly fresh, and the woman completely unsure how to respond to their threat, so we think it’s safe to guess the new series takes place near the beginning of the apocalypse. It is the second web-series launched in The Walking Dead‘s universe, after the success of last year’s Flight 462. Flight 462 famously saw the zombie apocalypse hit a passenger plane in-flight, to absolutely horrifying consequences. 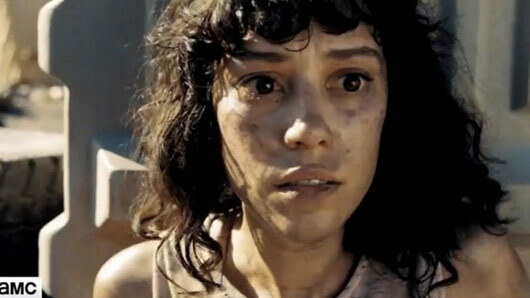 The series famously paved the way for full Walking Dead spin-off Fear the Walking Dead, as regular character Nick spotted the out-of-control plane flying low to the ground in the final episode of the web-series. There’s no confirmation about whether Passage could also include a crossover from either Walking Dead or Fear The Walking Dead, but since it’s all the same world, it’s always possible. Meanwhile, new episodes of The Walking Dead will premiere on AMC in the US this Sunday, October 23 and on FOX in the UK on Monday, October 24. The Walking Dead returns Monday, October 24 at 9pm on FOX.